Talks are in the works for a new commuter rail line from Boston to Concord, New Hampshire. 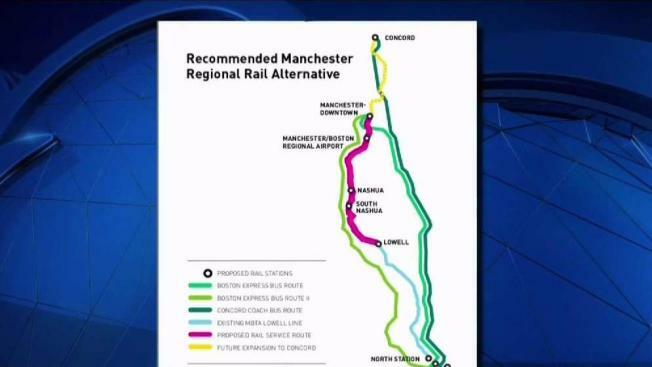 "Bringing a commuter rail to Manchester is an essential step in supporting and strengthening our community," said Manchester Mayor Joyce Craig. "I urge you to include this vital federal funding in the 10 year plan." "It will bring new workers and create new jobs increasing property values and boosting the residential housing market," said Tim Cummings. One state representative said he's been on board with a potential expansion for years. "Why not build for that future?" asked Representative Dale Sprague. "Be progressive and hopefully, that will come back in revenue for the state." "I think that no matter what the study shows, it would be too much of a subsidy we'd have to maintain every year, even if we did put something in," said New Hampshire House Speaker Gene Chandler. New Hampshire Governor Chris Sununu told NBC10 Boston that it's not up to the legislature to determine whether or not to move forward with the rail study.